Thanks to generous donations to the Wetaskiwin Health Foundation by individuals, organizations, businesses, clubs and corporations, Wetaskiwin can boast one of the best equipped healthcare facilities in the province. State-of-the-art equipment attracts and retains top notch medical professionals. That is why each and every investment that comes in to the Wetaskiwin Health Foundation is so important. Research has shown nurses suffer from work-related low back pain more often than workers in any other profession. The new cribs will assist staff as they can alter the height of the bed mechanically. The mechanical lift makes it easy for a caregiver to position the baby and more easily complete routine tasks, such as examinations or linen changes. Branin Thompson, Foundation Board member is also the Occupational Therapy Supervisor at the Wetaskiwin Hospital and Care Centre. She remarked, “how grateful they are for the support provided by the Lions and the community”. Foundation Executive Director, Lillian Dykes dug through the files and reported. “What I learned is the Lions first donation to the Health Foundation was for $6oo and made in January, 1988. That donation was designated to the ‘Greatest Need’. 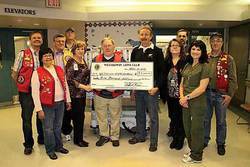 Over the years they have donated funds to other healthcare causes such as Greatest Needs, Helmet Safety, Telethon, Pediatrics, CT Scanner, Palliative Care, Cardiology and Surgical. Last February they donated $10,000 to EyeCare bringing their accumulative total at that time to $129,390.” With the recent donation of $23,000 the Lions will have invested a grand total of $152,390 in healthcare in Wetaskiwin. The Wetaskiwin Health Foundation is the essential link for creating and managing partnerships and alliances between healthcare representatives and individuals, service clubs, foundations, corporate representatives, and government. The correct mix of partners and resources are matched to satisfy the values of the donor and the needs of healthcare. For more information contact Foundation Executive Director, Lillian Dykes at 780-361-4130.